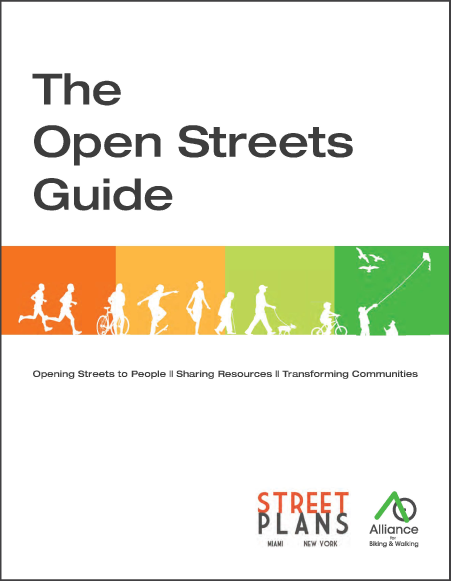 In partnership with The Alliance for Biking and Walking, and with funding from The Fund for the Environment and Urban Life, The Street Plans Collaborative completed a two year research project entitled The Open Streets Project. Open streets initiatives temporarily close streets to automobiles, allowing residents to walk, bike, skate, dance and utilize the roadways in countless creative and active ways. From Los Angeles to Ottawa, and Missoula to Miami, open streets have become a way for cities to build community, promote active transportation and reconnect neighborhoods divided by traffic. The Open Streets Guide features best practices from 67 initiatives across the continent, and serves as a tool for cities looking to start or grow an open streets initiative.